Home ADVICES 15 Motivational Quotes to Help You Lose Your Weight Fast ! “Losing weight is not my thing.” Do you often say this to yourself or your friends? But deep down do you feel let-down by yourself? Well, I did too. We are too scared of stepping out of our comfort zones. I remember telling myself that it’s ok to be chubby, I love to eat, I will start exercising tomorrow. This attitude finally made me 30 pounds heavier and posed serious health risks. To motivate myself to workout and eat healthy every day, I started writing motivational quotes on post-it notes. I put them at every nook and corner of my home, and this trick really worked! Today I am fit, active, more productive, and positive. So, for those of you who find it tough to change the current lifestyle, these top 20 weight loss motivational quotes will really help you, and you can reach your target weight in no time. Let’s begin. 1. Only I Can Change My Life, No One Can Do It For Me It’s true, isn’t it? You can blame your trainer, dietician, or even your family and friends for your weight gain. But at the end of the day, you have to take control of your life. If you do not adhere to the diet and exercise plan, even the best trainers and dieticians can do nothing about it. Learn to say “No” politely but firmly to your friends and family when they lure you into unhealthy habits. Tell yourself why losing weight is important for you. This will keep you motivated. 2. 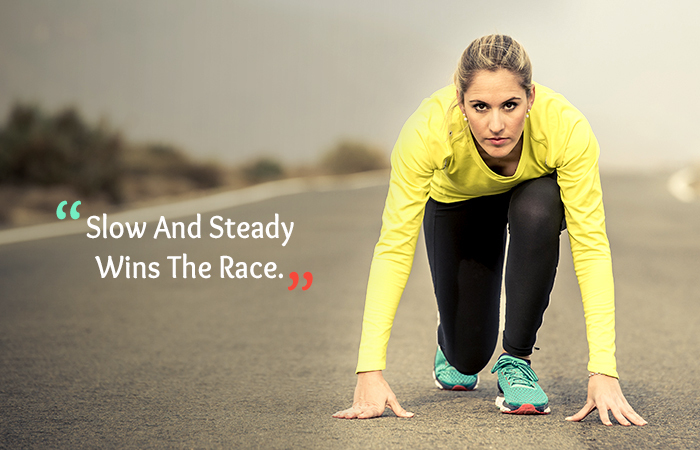 Slow And Steady Wins The Race This adage holds true even in this fast moving age. If you want to lose weight and maintain it, you need to go slow. Don’t look for fad diets that have flooded the market. They are called fad for a reason. You will only lose water weight and gain more weight back as soon as you stop the diet. When you start slow, you tend to change your lifestyle gradually. You will lose weight slowly, but your weight loss will be healthy and sustainable. When you start working out or eating healthy, it will be difficult to adhere to it. Even doing 10 reps of jumping jacks may seem like a struggle. But as you keep doing it you will be ready for more complex challenges. You will build mental and physical strength for the upcoming obstacles. Obstacles that you can overcome if you sweat and struggle today. I firmly believe in this. If you are spending your money and time to achieve something, it better produce results. 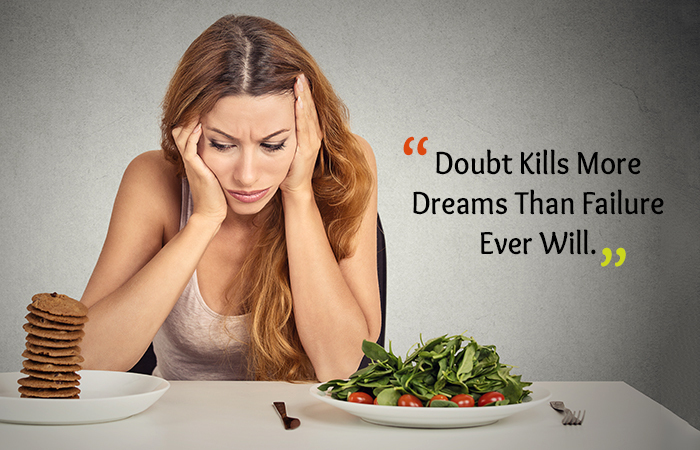 This is the smartest weight loss quote and will compel you to think whether you are making smart food choices or not. 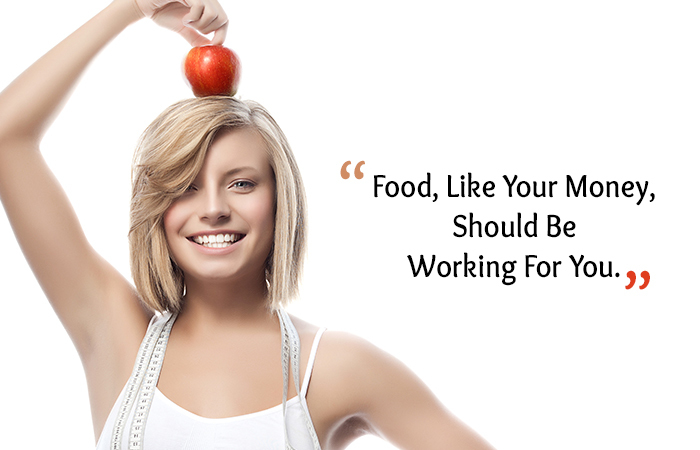 If you are spending more on unhealthy foods, then you will definitely gain weight. Try to spend your money wisely by eating green leafy veggies, nuts, fish, chicken breast, tofu, mushroom, lentils, sprouts, multigrain biscuits or bread, olive oil, rice bran oil, herbs, and fruits. 5. 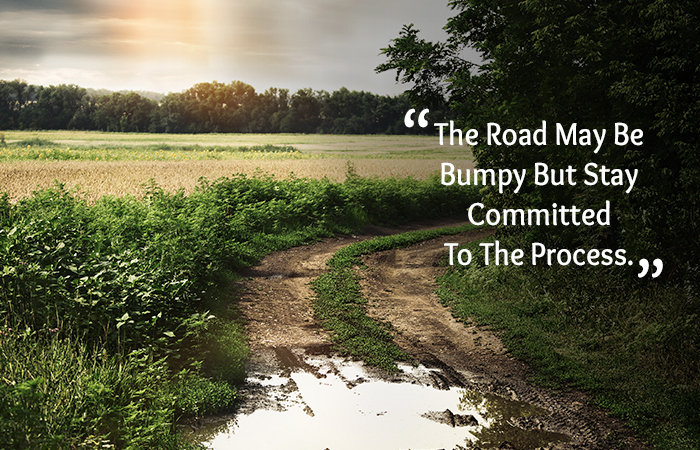 The Road May Be Bumpy But Stay Committed To The Process Yes, everyone has those days when they give in to cravings, or they skip working out. Plus, initially you will be less inclined to eat healthy and your body will be sore due to exercising. But that’s OK. In fact, every once in a while you should eat 500 calories more than the calories prescribed in your diet chart. This prevents the metabolic rate from plateauing. You may not immediately learn the proper way to squat, you may not do 10 push-ups right away, or you may even get injured. But don’t let these reasons stop you. Keep learning by staying committed. We have all done it. Tried different diets, joined new and better gyms, experimented with alternative methods of losing weight. But the main drawback is that we expect results too soon without staying 100% committed. And then again we start over with a new diet plan and a new gym. This process tires you out, robs you of your confidence, and is a demotivator. Identify your weak points, write them down, and strategize a solution. For example, if you have the habit of snacking frequently, better snack on healthy foods. If you can’t get up in the morning, go to the gym after work or school or workout at home. You know you can do much better than what you are doing now. 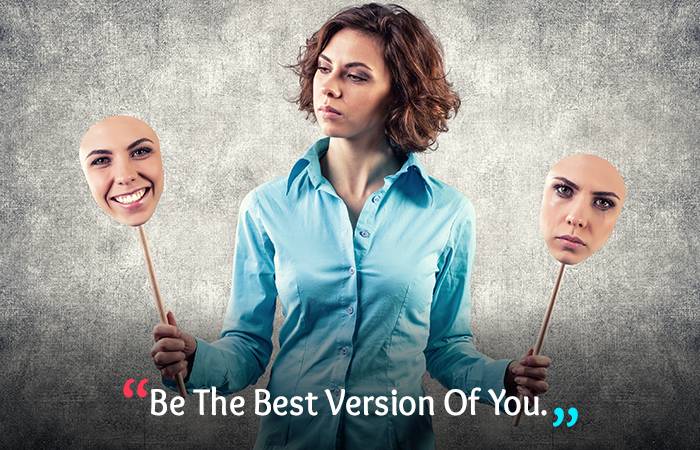 The only person standing between you and your better version is you! Creepy but true. This quote helped me tremendously and I stopped holding my trainer, dietician or anyone else responsible for my weight gain. 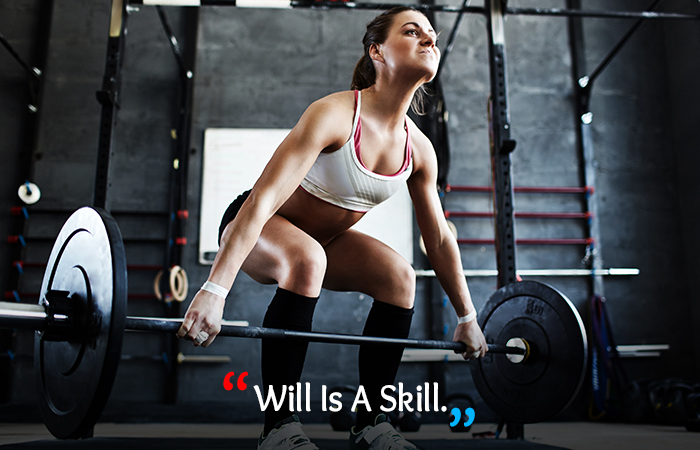 This quote will trigger the hormones that will help you become strong willed. 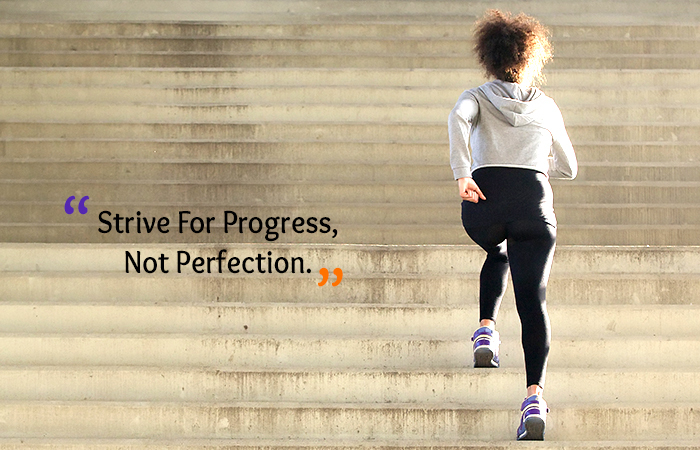 You will be motivated to go an extra mile to reach your weight loss goals. We women can come up with countless excuses to escape workout and eating junk. Feeling tired, got my periods, just one more bite, ice cream to beat the blues! These are just a few excuses women use to get over their guilty feelings and justify their frequent slip-ups. 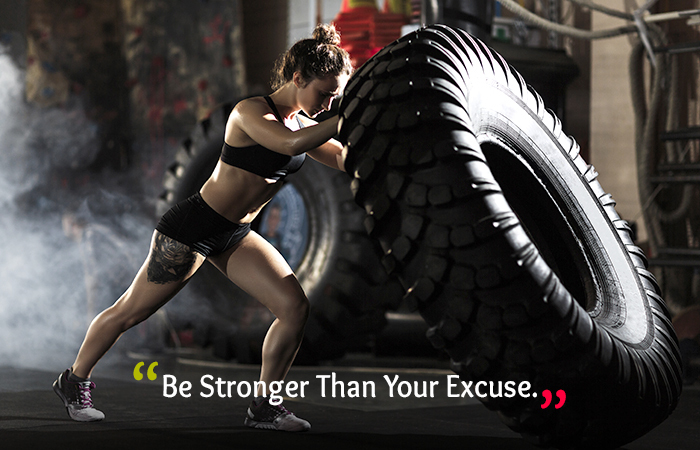 C’mon, you are way stronger than these excuses. You have achieved so much; you manage everything, you take care of others. Now it is time to take care of yourself. Be strong, take a step forward. 9. 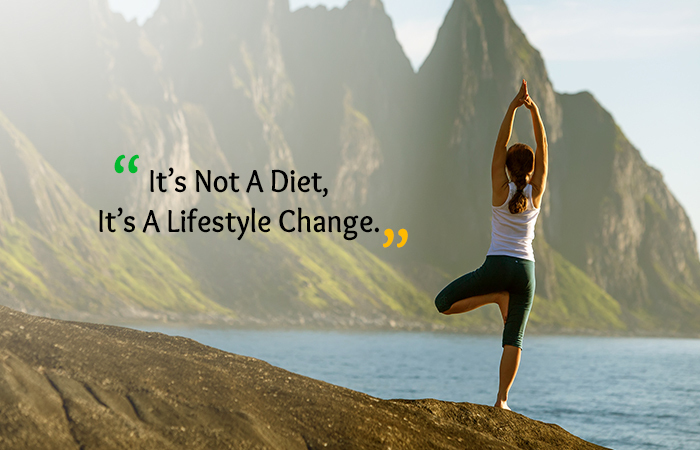 It’s Not A Diet, It’s A Lifestyle Change Many people ask me which diet I am following. But I do not follow any “diet plan.” I lead a healthy way of life. And that’s the best way to lose weight, live fit, stay young, and be more efficient. Incorporate healthy lifestyle gradually so that it’s a smooth transition. This will soon become a habit and transform into a healthy lifestyle over a period. Anything good that can happen to us is just too good to be true. In fact, we are so critical of ourselves that we give up on our dreams too easily. Don’t let it happen for your weight loss. Yes, you deserve to look and feel your best. 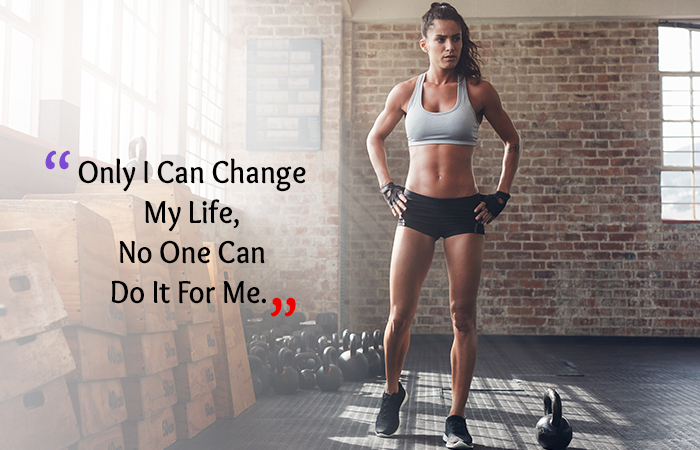 And believe me, you can achieve the body that you always wanted to. So what if you failed many times? Failures are stepping stones to success, learn from them and move forward. I totally agree with this. Being a foodie myself, it was not easy to stop myself from eating all kinds of foods. But once I started taking my weight loss goals seriously, and I lost weight I never felt so good about myself. To wear trendy clothes is one thing and to look good in them is another. Being thin doesn’t mean you have to be skin and bones, strive to be toned and shapely. You will feel light and be more comfortable with yourself. When it comes to losing weight your will power is most important. If it breaks too soon, you will not be able to lose weight. It is tough to endure pain and mental dissatisfaction, but that lasts only a few days. But then you have to train your brain to stay focused and determined. You will develop this skill gradually. It will take time but will give you results in all aspects of your life, not just weight loss. 13. Stressed Spelled Backwards Is Desserts. Coincidence? I think not! Whenever we are stressed, we reach out for a cup of ice cream, chocolates, cakes, pastries and what not! Stress leads to emotional eating, and we tend to overeat, which ultimately leads to weight gain. When you workout and eat well you will kick the triggers of the stress out of the window. 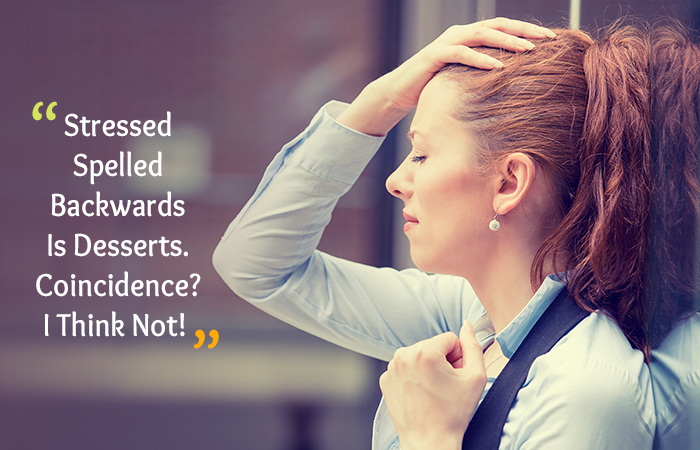 Be it stress at work or stress of not being able to lose weight, taking stress is not going to help you. 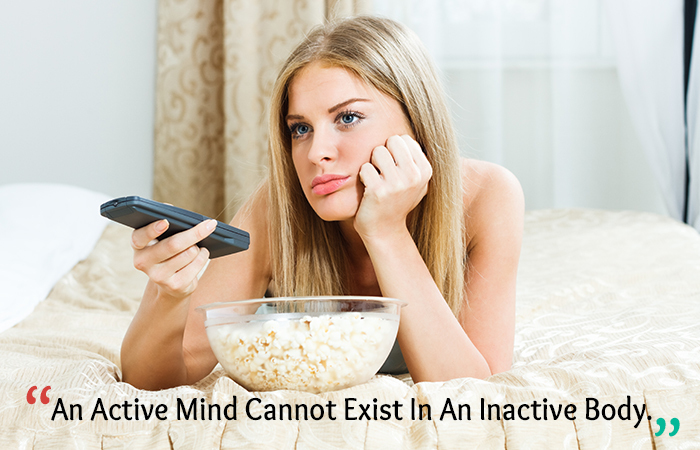 The more inactive you become the idler your mind gets. Or even if your mind stays active it will only work in a negative way. It will send you wrong signals of hunger and dissatisfaction. So, start incorporating at least an hour of physical activity into your daily routine. Don’t be too hard on yourself if you couldn’t adhere to your healthy routine today. Tomorrow is a new day and a new chance. Appreciate how much you have achieved and how far you have come. It is OK to skip the gym or have a hearty meal once in a while. Probably the best motivational quote for weight loss. It correctly states that you cannot expect your body to change by itself. You have to take the plunge, swim, drown, and float again until you reach your destination. Weight loss is not only about looking good, but it is also how you treat your body and soul. Take a step ahead, decide, plan, and then stick to the plan. I did it and I have achieved not only my weight loss goals, but I can also control my mind. It is tough but not impossible. 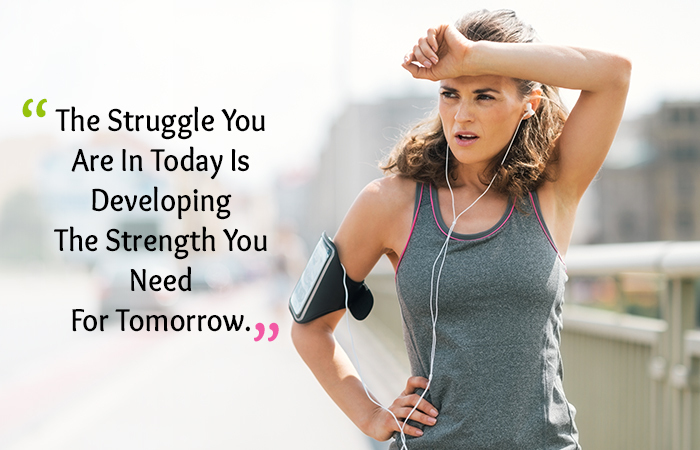 Stay fit with these 20 motivational quotes for weight loss. 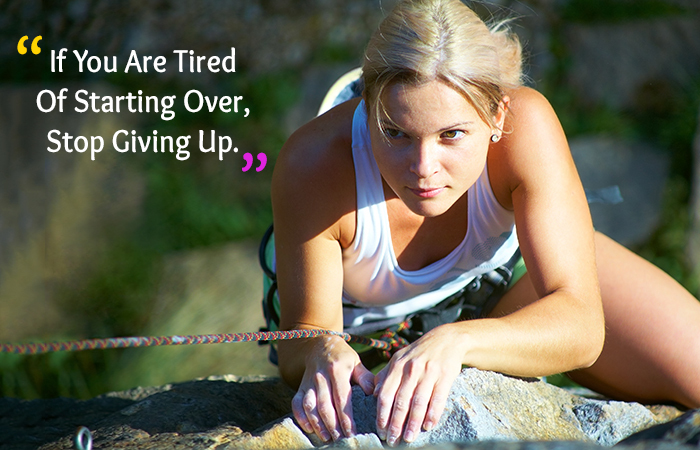 Don’t give up! Previous articleWhat are the foods that help burn fat ?